Make your school come alive! Valerie Williams can teach your kids about dance, choreograph your musical theatre production and work with your teachers in in-service training. She can set a Kids' Co'Motion production for performance (complete with costumes, set and lighting) with some or all of your kids and/or she herself can perform. 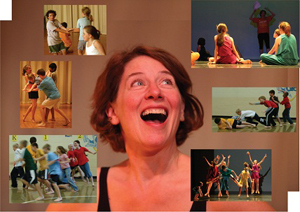 A much sought after residency artist since 1978, Valerie Williams teaches classes in dance technique, creative movement, movement in curriculum, composition, improvisation, social dance, folk dance, Renaissance dance and kinesiology. Through exercises designed to build strength, flexibility, control and creative problem-solving, students learn to dance and choreograph as they increase their movement vocabulary. Valerie Williams has been dancing professionally in modern dance, musical theatre, opera and Renaissance dance in North America, Europe and New Zealand since 1973. Artistic director of Co'Motion Theater, Valerie makes dances, produces concerts, directs the intensive performance workshop Kids' Co'Motion and in 2000 was selected 'Local Treasure' by the Ames Community Arts Council. Her current work uses wireless sensors, cameras, projectors and computers, exploring the human computer interface. Author of Lessons for Dance in Public Education, most recently she has written Now Foot It!, an instructional e-book on dances from the Renaissance and Middle Ages.